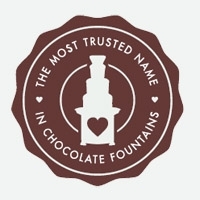 Providing clients with delicious chocolate fountain chocolate from Sephra is only part of your obligation as a commercial chocolate fountain rental business owner. You must also provide clients with an array of appetizing and attractive dipping treats. Why not create various sweet shish kebabs ideal for dipping in chocolate fountain chocolate? When it come to choosing dipping treats to layer on skewers to create sweet shish kebabs, think about taste and appearance. Although all the dipping treats displayed near the commercial chocolate fountain taste delicious when dipped into chocolate fountain chocolate, it’s important to layer food items that pair well together without the chocolate fountain chocolate. This way, when the two are dipped together, that first bite will be heaven, as all the flavors meld together for one satisfying taste. Color, shape and texture are important. Although the dipping treats you chose to layer might taste great together, do they look appetizing when paired on a skewer? For example, layering a chocolate brownie bite with a mini cherry muffin might taste great, but this layer upon layer of baked goods might look overwhelming to some guests. Instead, you’ll want to pair treats from different categories, such as fresh fruit with baked goods, baked goods with confections, or confections with fresh fruit. Balance is the key to the appearance, but taste is the key to keeping guests returning to the commercial chocolate fountain. The main exception is layering fresh fruit. This is always a delicious and healthy option! Start with simple combinations, such as layering strawberries with angel food cake. The juicy red strawberries will look even more sumptuous next to fluffy angel food cake and will be a winner dipped in chocolate fountain chocolate. For guests who love sweets, layering chocolate brownie squares over white mini marshmallows will taste fabulous dipped in white chocolate fountain chocolate, for example. Another great pairing would be layering an array of berries, like raspberries, blackberries and blueberries. Skewer colorful meringues with a complimentary fruit, such as lime green meringue with pineapple chunks, pale pink meringues with strawberries, and white meringues with honey dew melon balls. For a colorful twist, begin with a chocolate cake square, then a strawberry followed by a vanilla cake square for a modern color theme. Pound cake slices also layer well with a variety of fresh fruit, as does mini cheesecake squares. As long as chocolate fountain chocolate is waiting for guests at the end of the table, these sweet shish kebabs will capture the attention and impress guests’ taste buds – and make your commercial chocolate fountain a sweet success.